Spring has been slow and cold here. Sunny days are outnumbered by grey dull skies. Saturday, however, dawned with a bright blue sky - a perfect day for a visit to Butchart Gardens. One little grand stayed with us overnight while her parents were off celebrating their anniversary, so we called up the cousins and asked if they would like to visit the gardens, too. Daughter-in-law Katie came along to help guide herd the flock. Waves of tulips in a plethora of colour and shape greeted our eyes. Elizabeth Von Armin, author of Elizabeth and her German Garden writes "I love tulips better than any other spring flower; they are the embodiment of alert cheerfulness and tidy grace..." She goes on to disparage hyacinths for their untidiness, but since I love hyacinths, as well as tulips, I'll ignore that part. Although this was Miss S' first trip to the gardens, the cousins have been here many times as Katie worked here for several years and received a lifetime pass as a parting gift. So when asked where they wanted to go first, the Rose Carousel, seen in the top of the photo above, was their choice. This is the only carousel on Vancouver Island, and the 30 animals were hand carved by carousel artists. Each of the girls chose an animal to ride - a cheetah for Miss A, and a horse for Miss S. Mr. F rode in a bench seat with his mother. I held Miss S for reassurance as the music began, and the carousel slowly began to go round and round, and the horse rose and fell in a stately canter. Then it was off to see the dancing fountain shoot upwards, fan sideways, wave back and forth and generally delight. That one tulip petal looks as though it's waving in response. We've all heard of the dot.com bubble, but the first economic bubble of that sort concerned tulip bulbs. In the 17th century, in the Netherlands, there arose a great demand for tulip bulbs that saw a single bulb cost as much as a house. As in all economic bubbles, the burst bankrupted many. But the Dutch love of tulips continued. For an interesting summary of the 17th century Tulipomania, click here. Cheerful tulips nodded to us throughout our stroll. It's impossible to choose a favourite, but these rounded, slightly ruffled flower heads would be in the top 10.
or contrasted, as seen here with the pink and blue. They were all beautiful. 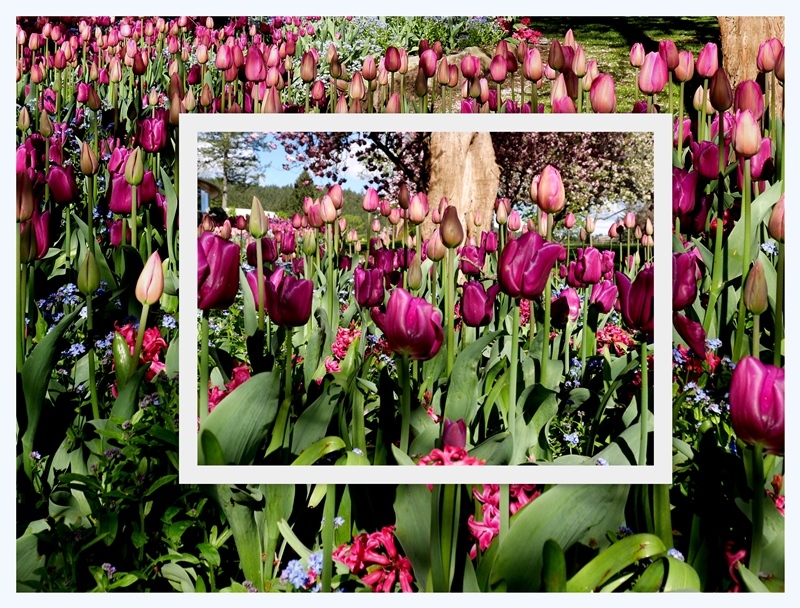 Can you spot the rogue tulip in the above photo? There's a standout in every crowd. Oh my goodness, those tulips! So gorgeous! And I do love hyacinths also because they smell wonderful. Thanks for sharing the stunning photos, Lorrie! So gorgeous! I did spot the rogue tulip. My friend visited there a few days ago and posted a lot of pics on FB. It is really a spectacular show this time of the year at the gardens. I would enjoy the carousel too....just my speed. I too can't think of anything better, tulips carousels and Grandchildren a great outing. A joy to visit and see those stunning tulips. Thank you for stopping by, Lori. You certainly chose an apt title for your beautiful post. The ruffled variety you showed is a bit reminiscent of peonies and I enjoyed seeing the great beds of blooms. I do love spring flowers! What a wonderful time to visit the gardens. The tulip displays are breathtaking. I particularly like the underplantings of forget-me-nots. So pretty. I do see that little rogue tulip. Made me smile. Gosh, that's all soooooo pretty!! I'm in tulip heaven! Thanks for sharing these spectacular shots! Lorrie, I love your description of a wave of tulips! Gorgeous! Never would have noticed without the prompt. I see it! Of all these tulip pics I like the one where you lay on the ground with your camera over your head looking straight up at the rare blue sky. That is how that shot was accomplished...yes? What a fun day for the grands! What stunning views of some of my favorite flowers! (Really though, is there anyone who doesn't love tulips?) 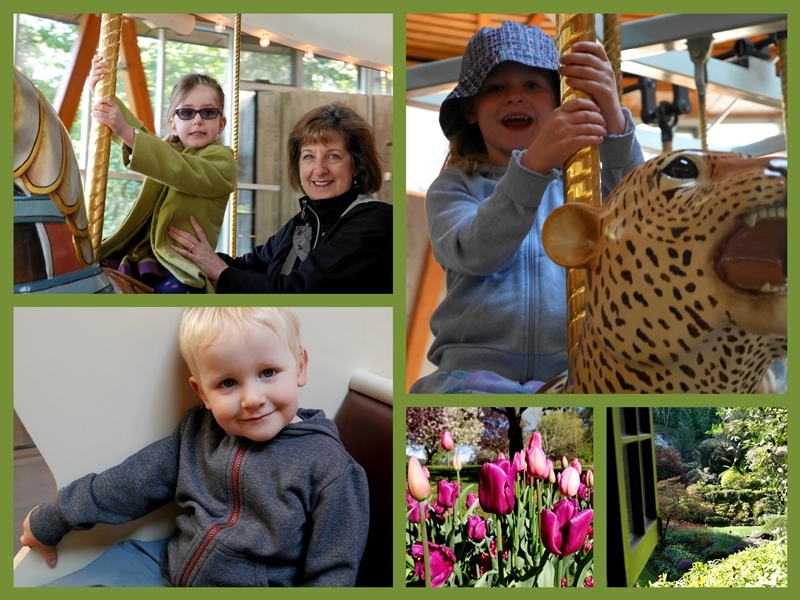 A little something for everyone on your stroll through Butchart Gardens! I've always loved tulips and daffodils and your photos show such a beautiful array of colors and shapes! They really are harbingers of spring and so hardy even if snow covers them for a bit. I can't grow tulips here as the deer eat them, but I but cut tulips for my vases inside. I did spy that rogue orange tulip among the purple...lol.. it ads interest! Simply stunning tulips as far as they eye can see, what a delightful time you must have had with the grandchildren in such a beautiful place. Have you read "Tulip Fever" by Deborah Moggach or "The Golden Tulip" by Rosalind Laker?, both have been recommended to me by a friend but I've yet to begin either! Hope your week just keeps on getting better. I would plant acres of tulips if the darn deer wouldn't eat mine. I sprinkled them with cayenne pepper this year & was able to save several from them. I saw the orange one...catching the sun! And as much as I love the tulips...can we go back and ride the carousel again now? Hugs! Oh Lorrie , these are stunning photos... I am severely tulip-deprived here in the subtropics, but even if we still spent Spring in the PNW, I know I'd be telling you that these are the most beautiful Spring gardens ever. Gorgeous park .. and I'd want to pick out a carousel animal for myself! Beautiful! I love the stand out tulip! I still love to ride a carousel! Those tulips are ALL just gorgeous, Lorrie. And that carousel is fantastic. I love the ones that are hand-carved like that--a real piece of artwork as much as a ride. Smiling at that tulip that does not belong. and I love tulips more than I used to. Simply stunning the way the tulips are in drifts of colour and contrasted with other colours and textures. I would love to go to the gardens throughout every season. I found the rogue. With the first picture I just knew where you were and my heart went pitter patter. Oh my, but the tulips are amazing. Thanks for sharing them with us. It's always fun to find the rogue! I'm pretty sure I did. I didn't realize there is a carousel at the gardens. A beautiful outing! Oh my what glories - and grand kids besides - perfection. The photos are stunning - you get such interesting angles. I always love stories about tulip mania. Happy week ahead to you. Lorrie, What beautiful tulips. Wonderful colors. Thanks for sharing. Sylvia D.
My favorite are the orange and yellow tulips with the sun shining through. They remind me of some I grew in my front garden before the relandscaping. Now I don't think there is a place for tulips... unless it's in a pot...? It doesn't get cold enough here to leave them in the ground, so they never bloom a second year. Oh my goodness Lorrie, the pictures are absolutely stunning!! I don't think I've ever seen prettier tulips and of course your photography skills are superb. What a fun day for the kiddos and you. It's always wonderful to see such gorgeous tulip blooms as these are. Thanks for sharing. So beautiful! We are so fortunate to have such a display of beauty in our part of the world every spring. I spent a few days in Victoria with friends this week; we never made it to Butchart Gardens but the tulips around the parliament buildings were lovely too!